Chocolate Drink Recipes: 6 Recipes That Your Family Will Absolutely Relish! 6 Chocolate Drink Recipes For Your Family! What do kids love even better than chocolate? A yummy chocolate drink! And it’s not just children who love the sweet deliciousness of a velvet-textured cup of drinkable chocolate – adults love it too. 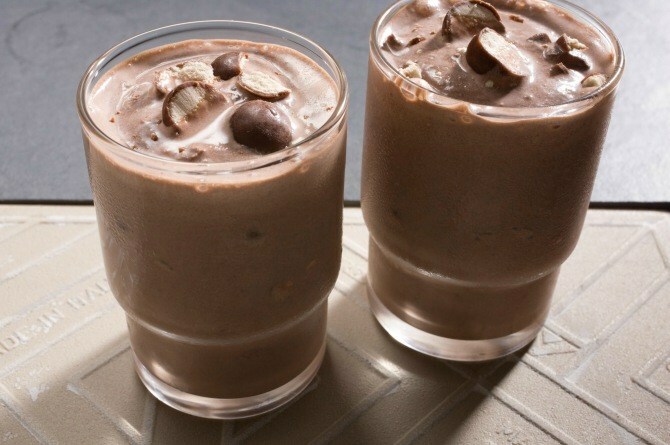 So without further ado, here are six chocolate drink recipes that the whole family will love. 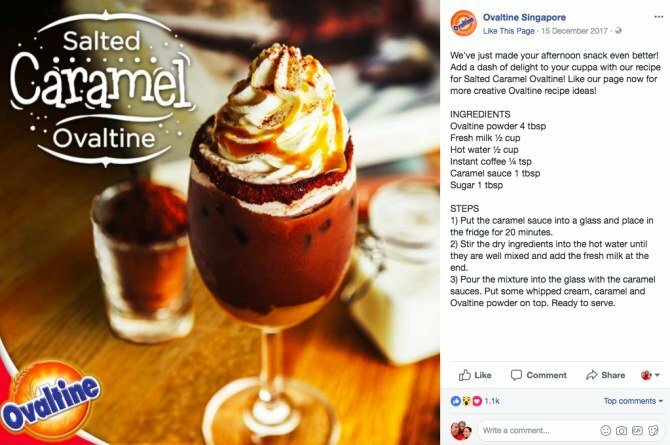 These drinks are extra special because they are made from Ovaltine, Horlicks and Milo, conjuring childhood memories for you, and creating beautiful memories for the kids. Who doesn’t love Ovaltine? This delicious malt drink definitely brings back childhood memories. It was already popular when you and your spouse were kids, but this yummy beverage is still a hit among kids today. These two recipes are just perfect for all those malt-chocolate cravings your family might have on a lazy Sunday afternoon! Are you looking for a sneaky way to get some fruity goodness into your kids’ tummies? This smoothie is lusciously thick, divinely chocolatey and surprisingly healthy! Put all ingredients into a processor or blender. Serve in a tall glass or cup. Makes approximately 16 oz. This is one of those chocolate drink recipes that can fight humid sunny days. It’s also an indulgent way to start the day. Add coffee to give it a kick for your spouse to give them a boost, or leave the coffee out so the kids can enjoy it. Either way, enjoying the drink together is a fun family affair! Put the caramel sauce into a glass and place in the fridge for 20 minutes. Stir the dry ingredients into the hot water until they are well mixed and add the fresh milk at the end. Pour the mixture into the glass with the caramel sauces. Put some whipped cream, caramel and Ovaltine powder on top. Ready to serve. This chocolate drink recipe is by freelance journalist and blogger Helen Best-Shaw. These decadent malted chocolate pots are perfect for special occasions with the family, and a sure-fire way to make any meal with them special! They’re also extra-easy to make with just three ingredients. Pour 200ml of the cream into a small pan and gently heat. Add 4 tsp of the Horlicks and whisk until dissolved. Once the cream starts to simmer, add the chocolate and stir until it has melted. 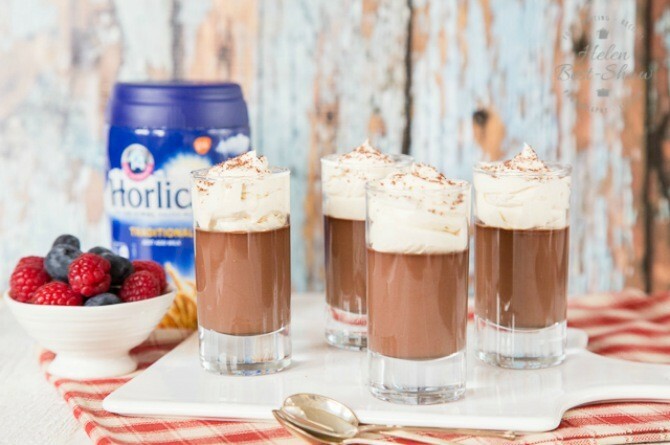 Pour the chocolate cream into 4 verrine or shot glasses. Then, allow to cool then keep in the fridge for up to 3 days. When ready to serve, whip the remaining cream with a teaspoon of Horlicks until thick, but still floppy. Next, top each glass with the cream. Grate a little chocolate over to decorate. Return to the fridge for up to 2 hours before serving. Here’s a chocolate drink recipe by Daniel Gavigan (a Horlicks Facebook fan), that’s just perfect to cool down on a hot day. This drink is made really special with texture, created through the addition of tiny, chewy chunks of malt balls. Plus you can make it extra special with the added flavour of vanilla ice cream and extra whipped cream to indulge! Put half a bag of chocolate malt balls in a blender along with the vanilla ice cream and milk. Add 3 to 4 heaped spoons of Horlicks Light Chocolate. Put half a bag of chocolate malt balls in a blender along with the vanilla ice cream and milk. Blend to achieve your desired consistency. Pour into a glass and top with whipped cream and sprinkle with crushed chocolate malt balls. 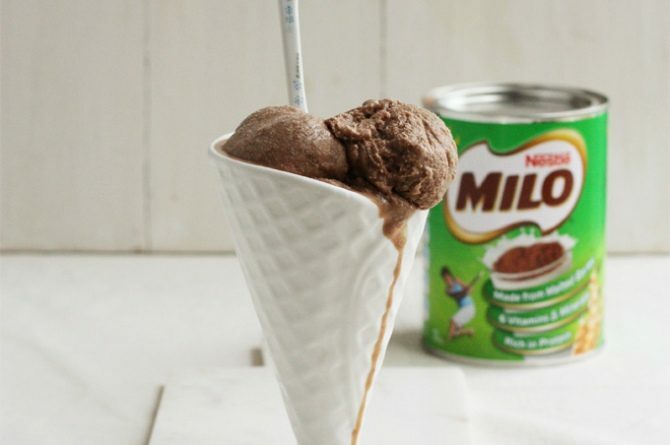 This isn’t technically a drink, but it’s a creamy malt and chocolate ice cream made out of Milo. So who’s complaining? Everybody wins because everybody gets ice cream! In a large heavy bottomed saucepan, heat milk, cream and salt on medium; stirring occasionally until hot but not boiling. Remove from heat and cool for approximately 5 minutes. In a large bowl, whisk together the egg yolks and sugar until well mixed. Slowly pour the cream mixture into the yolk mixture stirring constantly. Return the combined mixture to the saucepan on medium-low heat. Cook for about 3 minutes, stirring constantly with a wooden/rubber spatula. Make sure you scrape the bottom of the pan to avoid scorching. At the end of 3 minutes, the mixture will start to steam and will appear thickened. This is the custard. Remove the custard from the heat. Put the chocolate and milo in a large heatproof bowl. Pour over the hot custard and whisk until chocolate is melted and mixture is smooth. Pour the custard through a strainer into a clean metal bowl. Cool completely. Cover the bowl with clingfilm and chill in the fridge overnight (or at least an hour). When chilled, transfer to your ice cream maker and churn according to the manufacturer’s instructions. Enjoy straight away or store in the freezer for up to a week. If you or your kids had a long day outside, this is one of the best chocolate drinks that’s sure to replenish lost energy. The addition of banana, cherries and strawberries not just give this drink a delightful flavour, but is a sneaky mummy way of getting your child to ‘eat’ fruits! Mix banana, milk, peanut butter, Milo, cherries and strawberry preserve in a blender. Add ice and blend again until smooth. Also read: 6 Kinds of sleep foods that help you sleep better at night. Must-try: 5 yummy roti rolls for your kid's lunchbox!